At the age of about twenty-five David Baker was crossing a narrow bridge above a river in spate when the horse he was riding halted, unable to go forward or to turn round. If he escaped, he thought to himself, he would believe in God 'who hath more care of my life and safety than I have of his service and worship.' Suddenly the horse was inexplicably facing the opposite direction. From then on the young lawyer from Abergavenny took God seriously. 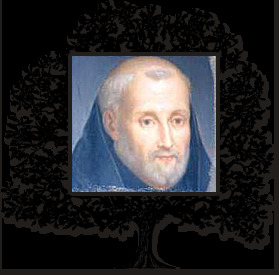 In 1605 he received the Benedictine habit at Padua and was given the name Augustine. Nineteen years later, when the young novices at Cambrai appealed for guidance in contemplative prayer, the President of the newly revived English Benedictine Congregation sent them the best man he could find, Father Baker. He laid the foundations of a spiritual tradition that has endured to the present day. The novices had found formal methods of meditation, requiring the use of the imagination or the reason, at odds with the way they were drawn to pray. Father Baker explained that discursive prayer was but a means to an end: the opening up of the heart to the direct action of the Holy Spirit. The search for God consists in learning to recognize and respond to these promptings of grace with the freedom of a loving heart. His instructions were oral for two years, but then 'the devout Dames' who pressed him to set down his teaching in writing had their way. During the next seven years the man who spent hours in prayer each day compiled nearly fifty treatises. The manuscripts began to be copied by others, Carmelite nuns as well as Benedictine monks. In 1633 he was accused of unorthodoxy and, though his name was cleared, was moved to Douai. Five years later he was sent to London, where he died on 9 August 1641. Father Serenus Cressy's digest of Baker's writings, Sancta Sophia (1657), was in print for much of the twentieth century under the title Holy Wisdom. Other Baker publications include biographical material and some treatises, notably those edited by John Clark.